Que se passe-t-il quand une femme zouloue et un homme afrikaans tombent amoureux puis doivent arranger leur mariage par le biais de la coutume compliquée dite « lobola » ?. Produit par Lance Samuel et Kweku Mandela (Out of Africa Entertainment) & Janine Eser. What happens when an Afrikaans guy and a Zulu girl fall in love and have to navigate their way through the complicated process of lobola? It’s a recipe for disaster explored in Fanie Fourie’s Lobola, a contemporary romantic comedy about love and tradition in a rapidly evolving society. Funny yet hard-hitting, the film tackles the thorny subject of cross-cultural relationships with humour and honesty. Directed by Henk Pretorius (‘Bakgat!‘, ‘Bakgat! 2‘), and co-written by Pretorius and Janine Eser, Fanie Fourie’s Lobola stars talented newcomer Zethu Dlomo as Dinky and film and comedy favourite, Eduan van Jaarsveldt as the affable Fanie. The film is the first from Once Upon a Story, a script development initiative headed by veteran industry leader Paul Raleigh and Janine Eser, which aims to take great South African stories to the big screen and the world. 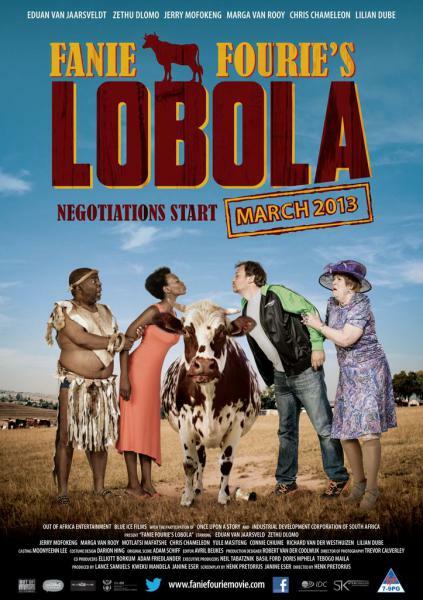 Fanie Fourie’s Lobola was produced by Lance Samuel and Kweku Mandela from Out of Africa Entertainment and Janine Eser.